Thomas E. Venker, Jr. - DeLoach, P.L. Our People » Thomas E. Venker, Jr.
Home » Thomas E. Venker, Jr. 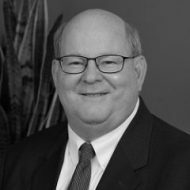 Throughout his career, Tom has worked in the areas of estate planning, probate and trust administration, taxation and general business. In estate planning, Tom has worked on estate, gift and generation-skipping transfer tax planning, revocable trusts, insurance trusts, lifetime trusts for spouses, grantor retained annuity trusts, charitable remainder trusts, qualified personal residence trusts, voting trusts, trusts for minors, intentionally defective income trusts and various other trusts. In probate and trust administration, Tom has worked on post-death estate and trust administration, federal gift and estate tax returns and fiduciary income tax returns. In taxation, Tom’s experience includes S corporations, C corporations, partnerships and estates and trusts. In general business, Tom has experience working on sales of closely held business interests and general corporate matters. Before joining DeLoach, P.L., Tom worked at the St. Louis, Missouri firms of Husch Blackwell LLP and The Stolar Partnership LLP. Although an attorney by training and experience, Tom is not licensed to practice law in Florida and works under the supervision of our Florida licensed attorneys.